As an experienced roofing company that serves the Alliston, ON area, we are confident we can meet your roof installation project’s exact specifications. Are you in the middle of building a new home? Do you want to make sure your new roof is installed correctly so that it withstands the elements and years of use? If so, make the right choice and let our team at Slippery Slope Roofing handle the installation of your new roof. As an experienced roofing company that serves the Alliston, Ontario area, we are confident we can meet your roof installation project’s exact specifications and go above and beyond your expectations. One of the main reasons why you should let us manage your roof repair project from start to finish is because we only take on one roofing project at a time. This allows us to provide completely focused attention and ensure all aspects of the project are taken care of with precision. In addition to this, we only use quality materials during all phases of the installation process. This means the durability and functionality of your new roof is ensured and that it withstands the harsh weather conditions we often experience here in Ontario. Although there are many other reasons why we are the right choice for your roof installation project, the final one we would like to bring up is that we are highly experienced. 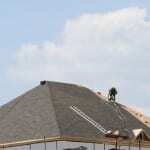 Together, our foreman and founder have been in the roofing industry for over five decades. You really can’t go wrong letting our roofing professionals at Slippery Slope Roofing take on your upcoming roof installation project. To discuss the specifics of your installation or to find out more about why you should work with us, please contact us today.